and Native plant materials to bring you the very best in Garden Design. Not only do I love this combo, but the Bees ADORE it. 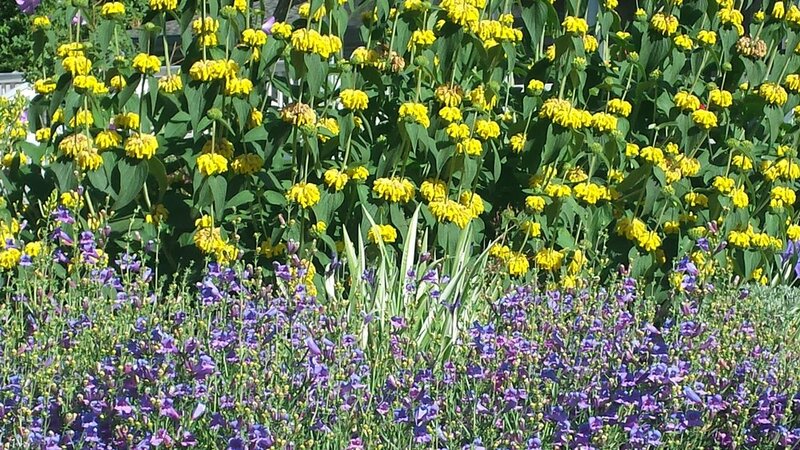 This planting of Phlomis, Variagted Iris and Foothills Penstemon brings together plants that are low water use, Native cultivars, and Habitat friendly. If you are looking for great recommendations or If you are looking for help getting really good plant materials, I regularly shop all of the local plant whole sale and retail nurseries and I can find the best of just about anything! Ask me about plant Allocation! Sometimes it seems like the deer will eat anything we put in front of them. This garden has no fence and is frequented by many deer. We contrived a mix of native low water use and deer tolerant plants that tolerate rocky soil to create dynamic beauty in this backyard.